If you tried to find St Georges on old maps you would be wasting your time, prior to 1860 St Georges did not exist, the area was then called Pains Lane. The area around Pains Lane was rapidly growing due to the Industrial Revolution which resulted in a new brick church being built to service the growing community. In 1857 when the Rev William Allen arrived in the Ecclesiastical District of Pain’s Lane, he had to live in the parsonage at Priorslee until the new vicarage was completed in 1863. His parish extended from the Albion Bank in the west to the toll gate on Red Hill in the east and from Snedshill in the south to the north end of Gower St in the north, just south of the Talbot Inn. The parish at this time consisted of less than 2000. The 1805 church was of a cruciform style, from the porch steps led up to a gallery which had painted pews like the rest of the church. The altar was a large block of wood attached to the wall, the font had a pedestal of stone which was painted to imitate marble. The pulpit was at the angle of the chancel and transepts of the church. Soon after his arrival work started on the new church, the stone was quarried locally from the hole to the north of Limekiln Bank. The foundation stone was laid on 4 November 1861 by the Rt Hon Earl Granville KG, with a silver trowel Earl Granville spread the mortar after having inserted a bottle containing parchment and some new coins into the cavity. 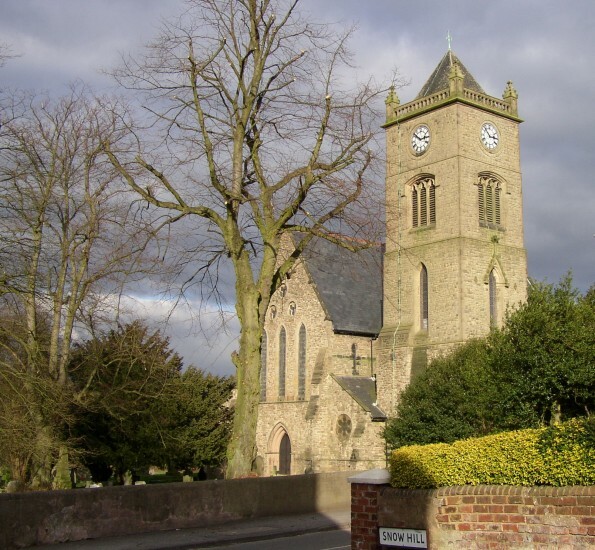 The church was designed by George Edmond Street RA and erected in the memory of George Granville, 2nd Duke of Sutherland and consecrated by the Bishop of Lichfield, Bishop Lonsdale, on 10 October 1862. The new church seated 800, with a chancel, a nave of 4 bays, 3 aisles and a porch in the South West side of the church. The church at this stage was without a tower. It wasn’t until 1928 that work was completed on the tower, with its bells, clock and a new flight of steps up to the road, the tower was formally opened in October 1930. It is now a landmark on the horizon which can been seen for miles around. Family Heritage Search is not responsible for the content of external Internet sites.